It has been a long time since I have this album of Sayer in my trough that contains albums to review. Even if I became a fan since the discovery of the very good Sounds of Atoms in 2014, I always had this reluctance to plunge into these albums which propose a dozen of tracks trapped in 75 minutes envelope of time. I tend to believe that the more the music is short and the less it's elaborated. It's thus with a little of skepticism that I had approached this “Random Access Melodies” which is a collection of 13 pieces of music written a little before the release of Sounds of Atoms in spring 2013. If we do the maths, that gives an average of a little less than 6 minutes by track. Enough time therefore to present some good electronic rock. And it's exactly the case of “Random Access Mélodies”! Digging in a creativity which makes no doubt further to the releases of Sounds of Atoms and, more recently, Cosmic Voyagers, Sayer shows his influences and its inspirations by presenting 13 tracks filled with adrenaline where the essences of Vangelis, Jean Michel Jarre and Tangerine Dream blow in our ears an EM rich in tones, in sounds and in changes. "G2X Intro" plunges us into a futuristic universe with a very theatrical opening, even dramatic, when synth lines twist themselves beneath the tones of heavy and threatening industrial breaths. That does very Blade Runner. A hopping rhythm hatches out a little after 90 seconds with keys which jump up with their shadows under some delicate caresses of intergalactic mist. This movement of sequences is very melodious. It's cozy and it starts the adventure with a rather pleasant taste to the ear. Each of the tracks here is enriched by permutations between soft and heavier, even violent, rhythms, thanks to a very good dosage between movements of sequences, sequences which constantly dance lightly and which drag their shadows in some indefatigable ritornellos of hopping rhythms, and patterns of electronic percussions which split their knocks between a heavy electronic rock and an Electronica at the embryonic state. There are tracks which hooked straight out! Track easy to catch like "Andromeda" where we have this strange sensation to hear a remix of the skeleton of melody sequenced of White Eagle from you know who. The movement is slightly stroboscopic, what makes us lose this illusion from time to time, but the imprint of the Dream constantly comes titillate this taste to hear the original version. 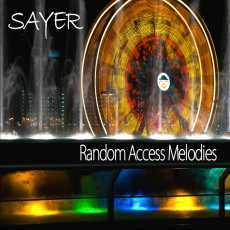 The electronic effects and the percussions which jump out from almost everywhere are boosters for our ears, an element of seduction in the music of Sayer, and the harmonies of the synth are very in the tone. "ElectroSynthesis" really sets the tone to this album with a heavy rhythm, very near the Electronica, and with very futuristic synth harmonies which roll in loops. It's there that Jarre should have gone. Especially that Sayer disposes of the 7 minutes of a clever way with effects of percussions and sequences which jump up as if they were dancing on a conveyor, while the other heavy percussions always continue to hammer the very lively rhythm of "ElectroSynthesis". A contagious track should I add. Just like with "Propel" and its movement of sequences which jump swiftly, such as blinking of lash, into Jarre cosmic layers, but with a more contemporary zest. A superb melody, quite fragile, goes out of the quite tumultuously introduction of "Moment of Enlightenment". WoW! And it turns, it rolls in loops, dancing crazily with these sequences which flicker with passion. I remember having made a link between Richard Pinhas and the music of Sayer on Cosmic Voyagers and it is even more true here. The same goes for the very enticing "Time Flows On" which has a melodic approach as attractive as that of Peter Baumann, even when it turns like a sonic spinning top under the heavy hammerings of bass drums. A mixture of dance and electronic rock, "SubSequence" proposes a pattern of rhythm in two opposed movements; either an upward movement and another one gyrating which has the hold on a heavy and slow structure coated by Redshift's dark perfumes. And like nothing is poured into concrete with Sayer, the rhythm embraces some technoïd elements with a blend of slamming sequences, others which flicker in a stroboscopic strand and with percussions, kind of bang-bang felted ones. The interbreeding of the rhythms is in constant reflection in the universe of Sayer and "Helix Nebula" does not escape this rule. If it's delicate approach of sequences, which flutter such as fireflies defying violent winds, throws perfumes of Software, the arrangements, these veils of floating violins, are adopting a subtle Arabian rhythm with a net Jarre tendency. After the disjointed rhythm to the very IDM trends of "In the Machine", "Time Flows On" seduced with its Pinhas movement of sequences in, East/West, whereas "Whimsical" dips us back into Jarre's dance floors. We definitively are in the dance segment of “Random Access Melodies” here and "Amaranthine" does nothing to moderate this perception. Nor the very spasmodic scrawny rhythm of "Underwater Caves", while that "Wind Travelers" concludes “Random Access Melodies” like "G2X Intro" had begun it, either with a slightly dramatic theatrical approach, and also a little more peaceful, where the slow rhythm swirls between its black and resonant sequences and its discreet bangings of percussions. At the very end, I have to admit that for someone who showed skepticism, I spent some very pleasant minutes with this album which shows that it is possible to make good creative electronic rock where the rhythms are as much imposing as the melodies. Another reason to be and stay a fan of Sayer!